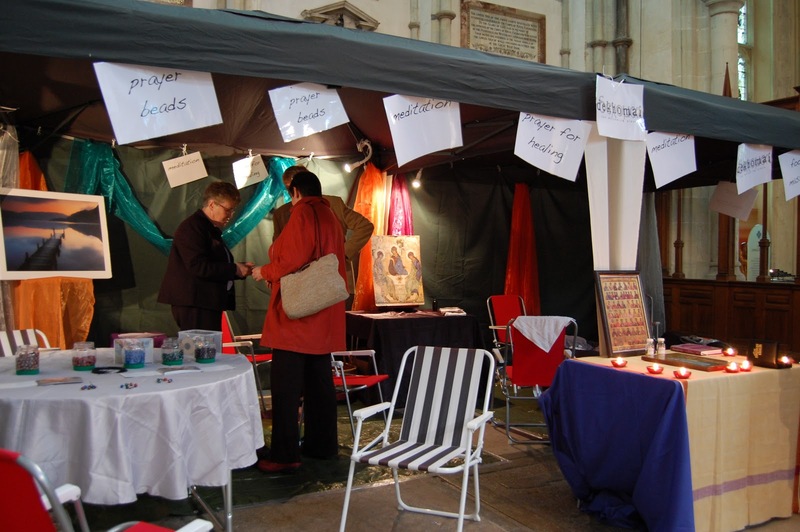 The weather today was rubbish and so we moved the Dekhomai stand into the south transept of the cathedral. Initially I was feeling a bit disappointed about this but it seemed to work quite well and by the end of the day we were talking about carrying on inside the cathedral tomorrow whatever happens with the weather. Inside the cathedral, with access to power, the stand looked more inviting and welcoming due to the use of light. The atmosphere was calmer and conversations with people seemed to flow easier. People came into the cathedral because they were looking for ‘something’ and finding Dekhomai was like finding ‘an oasis’ according to many that I spoke and prayed with today. Today I have had the honour of praying with people, laughing with people and even shedding a few tears with people as they have shared things which they would welcome prayer for. That may not sound that unusual to some – but as 90% of those I listened to today would not call themselves a person of any faith in particular I find that pretty mind blowing. What started as a day with me feeling sad at the ‘lost opportunity’ of being outside and available to the masses ended as a day where I felt very excited by what had happened throughout the day. I was reminded that it is God who draws people and that it does not matter where we are – people who are searching will be drawn to those places where they might be able to make one more step on their journey. Towards the end of the day Ross, one of the team, looked above our stand to the stained glass windows of the south transept. There above us, unnoticed was a stained glass window of St. Florian, the patron saint of Sweeps. Is this God telling us we are in the right place for this festival. we are giving out the prayer of St Florian and praying the blessing of St Florian with people; where better to do that than at the feet of the window of St Florian himself? Or … is that just coincidence? This entry was posted in cathedral, mbs, sweeps by robryan65. Bookmark the permalink.